Identifying the factors that contribute to chip seal, or seal coat, performance has been a pavement engineering research concern for many decades, with studies on surface treatments dating back to 1928. Recent pavement engineering studies have provided sound, general advice on the use of chip sealing as preventive maintenance on roads; however, the performance of chip seals can vary largely by location. Variations in materials, construction practices and environment—all of which are tied to local roadway conditions—can dramatically affect chip seal performance. Surveys conducted in a 2013 Minnesota Department of Transportation (MnDOT) study found that 40 of 66 local Minnesota agency engineers observed stripping under chip seals in their city or county. Stripping concerns for municipalities in Minnesota was especially focused on chip seals of asphalt pavements constructed in the mid-to-late 1990s, some of which experienced premature aging and subsequent stripping. 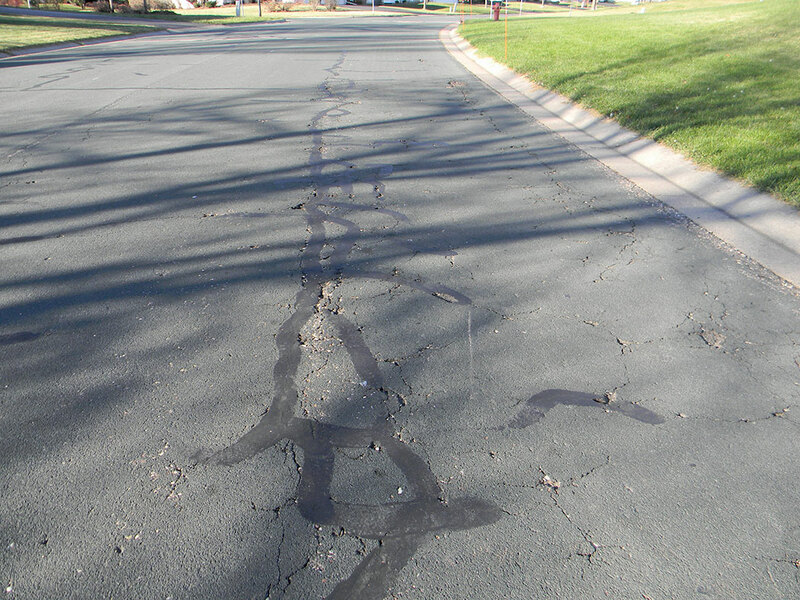 Given Minnesota’s local engineer experience with chip seals, the 2013 MnDOT study of chip seals attempted to identify causes of stripping in chip-sealed pavements. 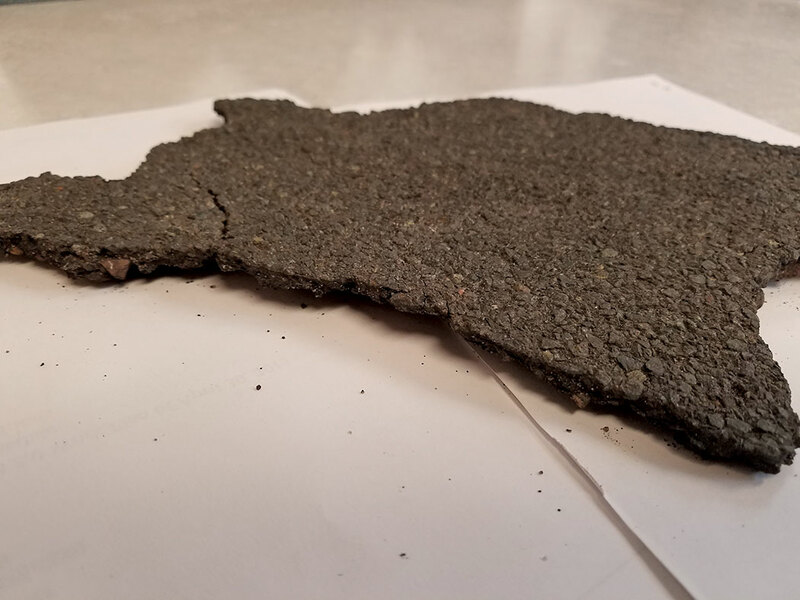 After testing of field and laboratory specimens, the study concluded that less dense areas, or high air voids, in the underlying asphalt were the main cause of stripping in Minnesota chip-sealed pavements. Due to continued interest in the topic, the Minnesota Local Road Research Board (LRRB) sponsored a second study, performed by American Engineering Testing Inc. (AET) of St. Paul, Minn., to more exhaustively test and understand chip-sealed pavements. The primary goal of the study was to verify the conclusion of the 2013 MnDOT study, that high air voids are the primary cause of stripping. In addition, the follow-up study conducted by AET attempted to (a) investigate if and why high air voids occurred and (b) identify mix design or construction practices that may have led to observed stripping. 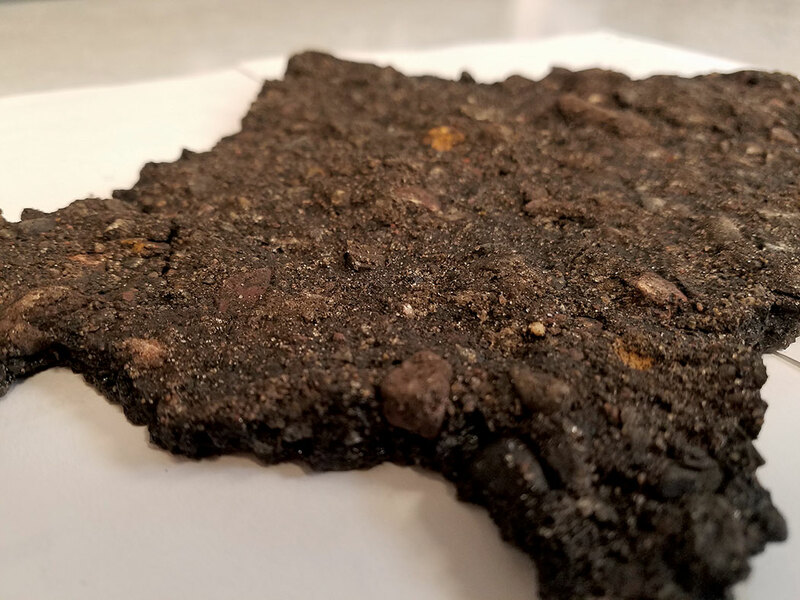 The surface and underside of a chip seal that has flaked with stripped material from underlying asphalt pavement. A nuclear gauge was used to assess the density of pavements on-site. Backscatter testing was applied in accordance with ASTM D2950 to quickly assess both properties. Two rounds of nuclear gauge testing were performed at a total of 37 locations. Mix data was available for 29 of the 37 locations assessed. Extensive nuclear gauge testing was later conducted in six municipalities to be coupled with the results of GPR testing during analysis. The tensile strength ratio (TSR) test was performed on specimens to measure tensile strength loss due to damage under accelerated water conditioning in the laboratory. The modified Lottman tensile strength ratio (TSR) test was conducted according to AASHTO T 283. TSR tests were applied to a total of 18 specimens. Given the extent of the field and laboratory testing in the LRRB study conducted by AET, there was sufficient data to support general observations that would be unsubstantiated in smaller studies. Based on the condition surveys from field testing, a simple but necessary observation was that not all roads with chip seals exhibited stripping. Information provided by city engineers for field site locations identified less than moderate levels of stripping in six of the 18 primary field sites. This agrees with the results of a survey of 129 municipal engineers conducted during this study as a follow-up to the 2013 MnDOT survey. The survey conducted in 2015-2016 during this study determined that 74% of city engineers did not identify stripping in chip seals as a major issue. More importantly, based on condition data and volumetric core data (percent air voids and maximum density), AET did not observe a correlation between stripping behavior and excessive air voids or air void content in general. An example of a chip-sealed road pavement in the town of Woodbury, Minn. Prior to the 2013 MnDOT pilot study, many state and municipal engineers supposed that there may exist a relationship between (a) a specific bituminous mixture, contractor, geographic location, or year of construction, and (b) the likelihood and extent of stripping. Using the assembled database for this study, AET observed no correlation between material, construction, timing, or location factors and stripping. To address more general concerns about asphalt compaction­—rather than issues specific to chip seal treatments—a second round of nuclear gauge testing was conducted on additional roads (i.e., roads beyond the 18 locations of the study). The combined tests for density found that the average maximum density across all municipal locations was 93.3%. This study suggests that Minnesota municipal construction practices generally result in adequately compacted pavements. To that point, the air void content for the original 18 chip-sealed sections examined was 8.5% or lower, thus no sections with excessive air voids were considered in the analysis. Does the use of polymer-modified emulsions for chip seals lead to stripping? A large percentage of municipalities surveyed were unable to identify dates or years for polymer-modified emulsion adoption for their chip seal treatments. Therefore, a relationship between the presence of polymers and stripping could not be determined. Finally, the project research included a few field sections featuring neighboring chip-sealed and unsealed portions (a practice that is common in cul-de-sacs). It was observed (anecdotally, as only a limited number of sections applied) that chip-sealed portions experienced more block cracking than unsealed areas. While the field and laboratory work conducted in this project was extensive, many concerns surrounding the behavior of chip-sealed pavements remain unresolved. The study was not able to verify the conclusion of the 2013 MnDOT study that high air voids are the primary cause of stripping. The study also was unable to identify a direct relationship between pavement density and stripping under chip seals. In addition, there does not appear to be a direct relationship between any specific bituminous mixture, contractor, geographic location, or year of construction and this distress. 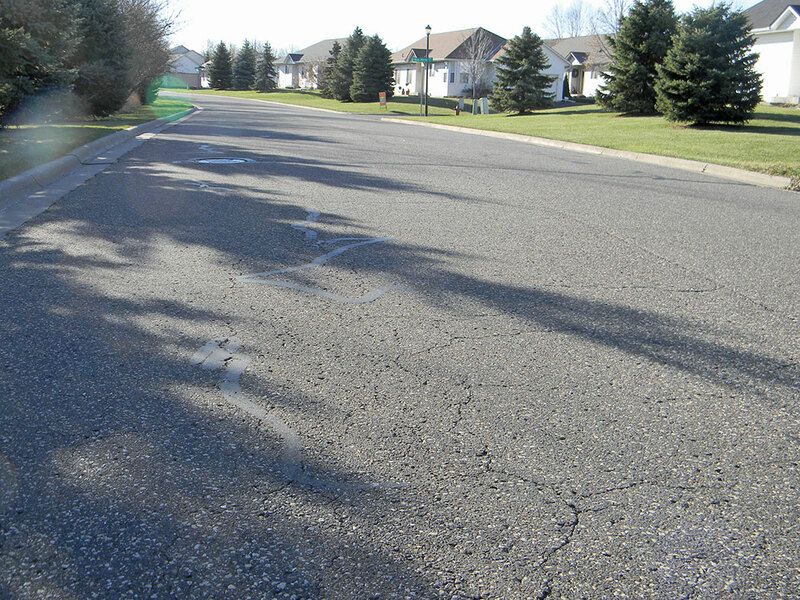 Road pavement in Woodbury, Minn., a suburb of St. Paul, that has not undergone chip sealing. Based on the study, AET concluded that, while stripping under chip seals is a concern, it cannot be addressed with a simple mix design or paving rule-of-thumb. AET also observed that stripping behavior under chip seals may be due to trapped moisture and water vapor between the chip seal and the asphalt pavement. This phenomenon would resemble stripping behavior observed in conventional overlays of asphalt. Thus, appropriate drainage is important in chip-sealed pavements, as is limiting early damage that may induce micro-cracking that allows water vapor to be transmitted from the base layers into the pavement layer. Finally, many of the cities surveyed during the study reported that they had considered the use of thin bituminous overlays, approximately 5⁄8 in. thick, as an alternative to chip seal treatments. In Texas, these fine-mix overlays have shown promise as a surface treatment on oxidized pavement and as a surface treatment to extend the life of roadways exhibiting signs of stripping. Studies have shown these thin overlays can extend service life by an additional three to five years before a mill-and-overlay is required. Cities and counties searching for alternatives to chip seals may consider the fine-mix overlay, in which case the Texas Department of Transportation specification for fine-mix overlay mix design may be a worthwhile starting point. More details on the LRRB study can be found in the project final report, available at http://dot.state.mn.us/research/reports/2017/201735.pdf. Rettner is president and principal engineer at American Engineering Testing Inc. Tompkins is a principal civil engineer at American Engineering Testing Inc.